In the near future, space corporations and agencies set out to explore and colonize the Solar System. Your organization will compete to design the most efficient and powerful spacecraft, to gather scientific knowledge, and transport colonists to distant worlds. Charge up the monster rocket boosters, assign your crew, and race for space! 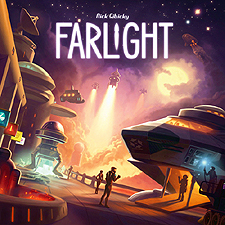 Farlight is a streamlined game of spaceship building, resource gathering, and bidding wars.